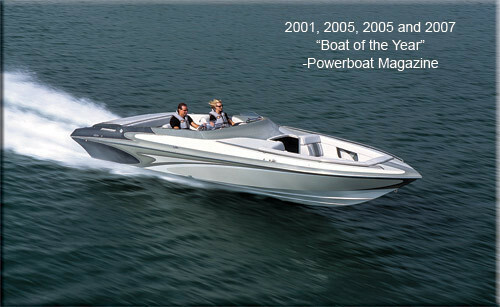 Designed for the performance enthusiast as a dual-purpose high performance family sport boat or an all out APBA Factory 1 race boat, the Howard 28 BULLET CUDDY / OPEN BOW is the perfect blend of style and performance. Utilizing the most up to date advanced ventilated-stepped hull technology available today, the 28 BULLET CUDDY / OPEN BOW delivers speed and performance as only a Howard can. 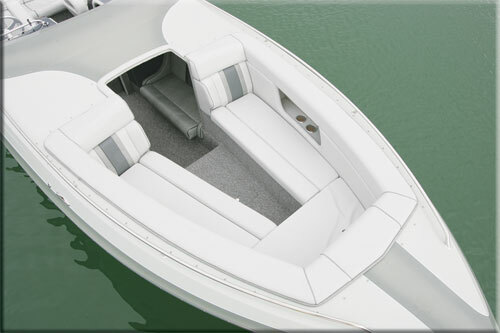 Equally at home on large lakes and unprotected bodies of water, the 28 BULLET CUDDY / OPEN BOW epitomizes high performance boating at its finest. 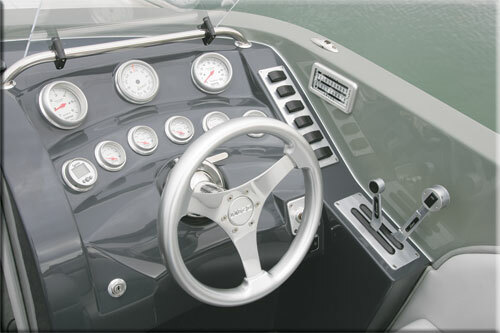 We have designed an ergonomic cockpit that has more interior space, and then some, than any other boat in its class. 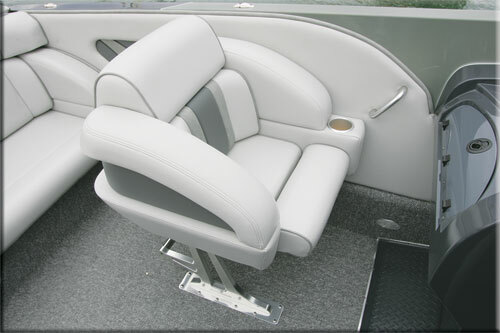 Race designed drop out bolster seats, with built in lumbar support, hold you comfortably in place regardless of water conditions. 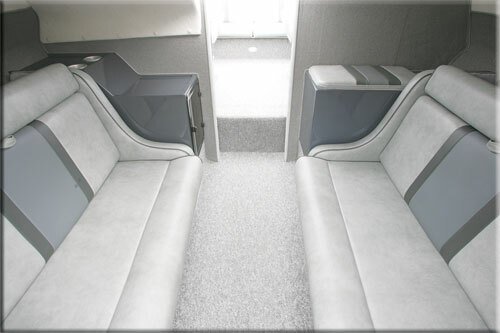 Standard seating for ten is accomplished in unparalleled comfort. 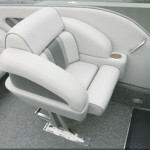 An optional rear seat incorporating four individual buckets, with built-in headrests on the sundeck, is also available. 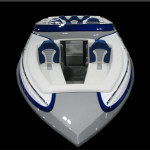 Howard’s innovating styling and technology allow for a full fiberglass sundeck presenting a flush molded-in modern look. This design eliminates protruding scoops from the center of the hatch, so that nothing detracts from the clean sleek styling (supercharged motors, obviously, are the exception). The spacious cabin is pure elegance. 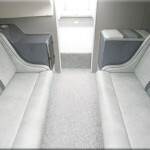 Twin facing convertible couches provide seating for four adults as well as providing additional sleeping space. An optional entertainment center complete with electric blender, icebox with wet bar and running water is also available. Up front there is a deep plush bow section that seats four adults comfortably. For those who truly appreciate luxurious quality and performance, there is nothing finer than the 28 BULLET CUDDY / OPEN BOW. The HOWARD 28 BULLET CUDDY / OPEN BOW is constructed using only the finest materials available. We start with full-blown 100% vinyl-ester resin and Knytex knitted Bi and Tri directional glass fabric. 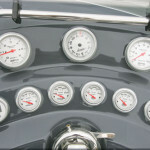 The entire hull is cored with 1/2″ end grain Baltek Balsa and Baltek foam. 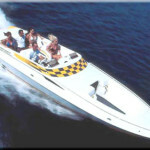 The four full-length stringers are made from laminated marine grade plywood. 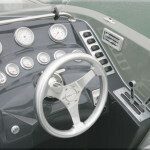 The hull and deck are joined together with Knytex 1708 Bi-directional glass fabric. 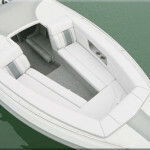 Self draining floor liner, sundeck are molded one piece (Balsa cored) fiberglass. All stringers, bulkheads, floors and fuel tanks are installed while still in the mold to insure a perfect fit. Like all Howard’s, the mold cure time is two weeks to insure proper curing and strength with no distortion. 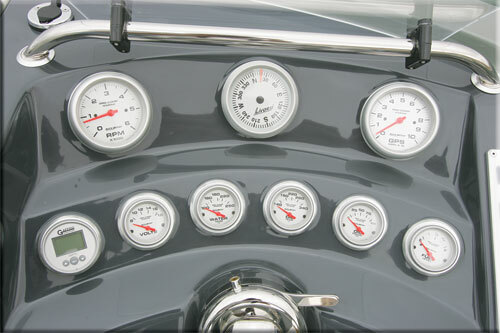 All hardware is grade A aircraft quality stainless steel. 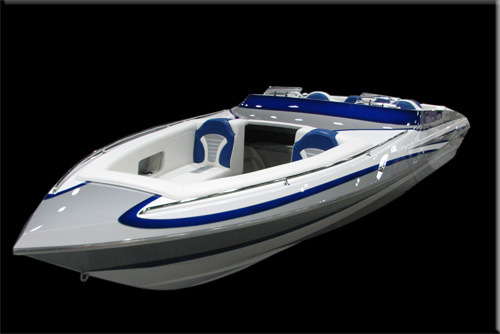 Howard’s absolute insistence on quality and meticulous attention to detail has produced the finest performance boat available. Exhilarating, Fast, Stable, and Smooth Riding’ One ride and you will be saying all of these things. 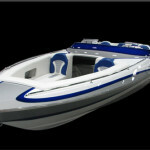 With its ocean tested bottom the 28 BULLET CUDDY / OPEN BOW is afraid of nothing. 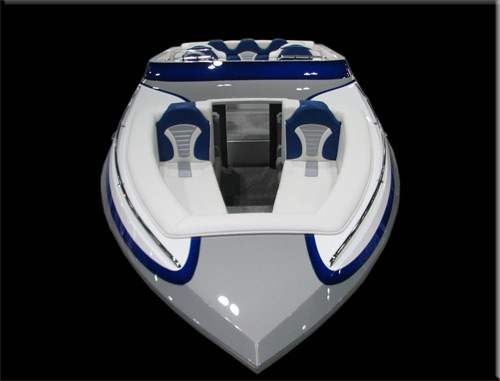 Our unique bottom design allows the 28 BULLET CUDDY / OPEN BOW to run regardless of water conditions. 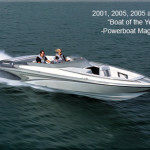 80 plus mph speeds with the MerCruiser HP525 to over triple-digit numbers with optional power. 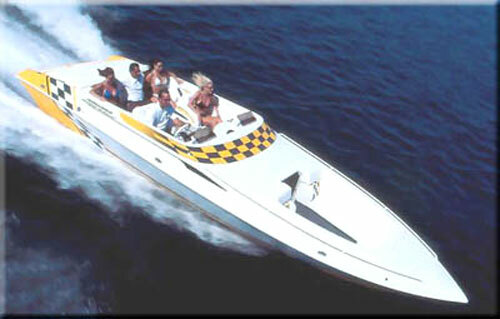 THIS BOAT PERFORMS! Just listen to what the pros have to say “quotes”.